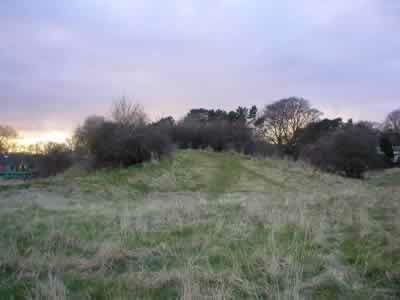 Moot Hill is a mid to late 11th century earthwork motte and bailey fortress, founded by Morcar. Underlying the castle are the postulated remains of King Aldfrith, 8th century Northumbrian palace and evidence of 4th century Roman occupation. After Mortcar's rebellion the castle was abandoned until the early to mid 13th century, when it was re-fortified as an important royal residence. Excavations in 1975, found several phases of bridge construction across the wide ditch that still separates the motte from its bailey. This once large motte has been badly damaged by 19th century quarrying and houses have encroached on the bailey. 6 miles north-east is Burton Agnes Manor House and 11 miles south-east is Skipsea Castle. Moot Hill is located in Driffield, off Gibson Street. 28 miles east of York, on the A166.